Teenage Mutant Ninja Turtles 2 is currently filming in New York City. We've been seeing photos from the set plastered all over the internet, and Megan Fox and the original April O'Neil, Judith Hoag, were recently spotted in Times Square. The studio is upping the ante the second time around with a number of classic character appearances, but they're keeping the best one close to the vest. We've learned that a classic villain from TMNT canon will be making an appearance in TMNT 2, and if you've been paying attention to the rumormill, you might already know who it is. Apologies for all the mystery and mystique, but if you want to remain free of spoilers, then you should turn back now. Otherwise, keep on reading. 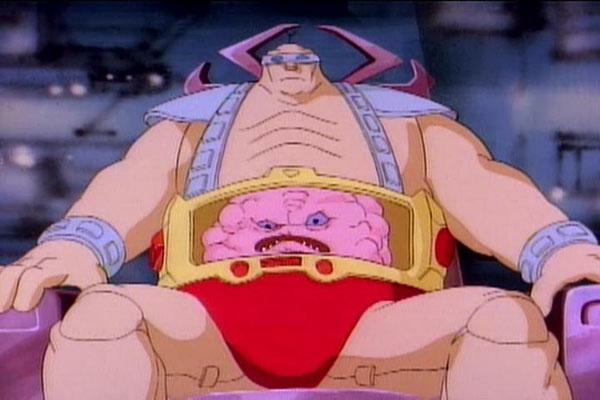 According to a source close to production, Krang will be featured in live-action in TMNT 2. This source said that the production recently filmed a scene last week involving a number of extras and the character's arrival on Earth through a portal of some sort. We have yet to confirm this information outside of the mentioned source, but given all we know of this current run of films and the rumors, we have every reason to trust this intel. Krang was created for the animated TMNT TV series, and is a warlord from another dimension, called Dimension X, who commanded a massive army. After losing his body, he came to Earth where he met Shredder. The Turtles' adversary teamed up with this blob of brains and, by doing so, agreed to construct a new body for him in exchange for use of his high-tech base, known as the Technodrome. Though they were taken down from the web at the request of Paramount Pictures, concept art of Krang, as well as Bebop and Rocksteady, revealed what he would've looked like in the first Teenage Mutant Ninja Turtles movie, if the filmmakers had decided to feature him. While he did not appear, it looks like the he's been biding his time for a bigger splash in the sequel. Paramount already announced that Bebop and Rocksteady will be featured in Teenage Mutant Ninja Turtles 2, and they'll be working alongside Shredder (played by Brian Tee) and his Foot Clan. Their inclusion only adds more fuel to the fire that we'll be seeing Krang. Not much else is known about the plot of TMNT 2, but the inclusion of Krang speaks of a number of possibilities. We also have Megan Fox returning as April O'Neil, Laura Linney in an unknown role, and Arrow's Stephen Amell debuting as a different kind of vigilante, Casey Jones. The film will hit theaters starting on June 3, 2016.